Don’t be afraid to go Into the Woods or on to the court wearing your new tennis outfits! Lucky in Love is known for dependable sizing, flattering styles, and layered skirts, and this new collection has it all! Black, Lemon Frost, and White color combinations are perfect for your Fall and Winter Season. This collection has 4 tank tops that you can mix and match easily with any black or white skorts you already own. Of course, it’s more fun to complete your look with new skorts from the collection. The Mesh Drape Tennis Tank has become a flagship look for Lucky in Love, and I can see why! I personally own a few of these tanks, and they feel great on court! Even though the tank underneath is fitted to your body, the mesh overlay hides anything you don’t want to show off – ahem, slight muffin top, maybe? I mean, I’m in shape but tennis clothes can show every little bump. The mesh gives me extra coverage, but stays breathable. 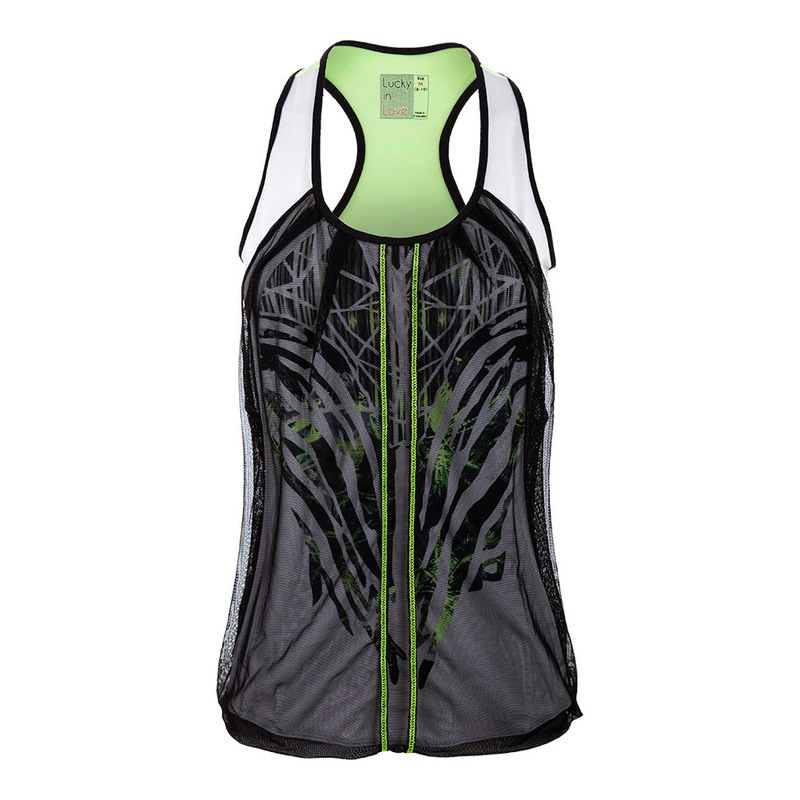 The racerback and scoop neckline provide a full range of motion for me to put away that overhead when it comes my way! Colorblocking and a mesh neckline are my favorite features of the High Neck Cami, but you may love the fact that it comes with a built in bra. The thinner than usual straps on the back of the tank are tight enough to truly add support, without sacrificing your comfort as you reach for balls above your head. I know a lot of ladies on my team love to protect their chest area from the harsh rays of the sun, and this is a great solution for that! The Mesh V-Cami Tennis Tank also has a built in bra to lend some support on court! The mesh neckline provides coverage with breathability, and this cami has a looser fit in the tummy area. The elastic straps form a Y Back that keeps everything in place without binding. The Lemon Frost color of this tank lends a great pop of color to the dark skirts in this collection! Want to keep your team guessing which new outfit you’ll wear at next drill? Wow them with the Shadow Play Racerback Tank. This tank looks like it came straight from the catwalk to the tennis court with its mesh detailing and pops of Lemon Frost color against a flattering black background. Mesh shoulder and back panels keep you cool, while the mock sweetheart neckline accentuates your bust. Hey – sometimes it’s better to look better than to play better, right? Lucky in Love is known for its layered skirt look, and they’ve made 3 layered skirt choices for this collection. All of these skorts have 2 features I’m always looking for in a skort: built in shorts and a wide waistband. The Scallop Tennis Skort in Lemon Frost is a great choice that can be worn in every season of the year. It’s 12″ long and has decorative stitching along the layers of fabric in the same color of the skirt. The Shadow Play Mesh Skirt plays on the woodsy theme of the collection with printed fabric under layers of black mesh. The Lemon Frost taping gives this 12″ skirt the pop of color to match any of the tops in the collection. My personal favorite (yes, oh yes, it will be mine) is the Stroke of Luck Long Skirt. I love this skirt because it’s 14 inches long and has the print from the collection peeking out from underneath the layers. But really, I like the clever name too. Yesterday I was playing a friend when her ball tipped over the net cord and died on my side of the court. She shouted out, “I’d rather be lucky than talented!” I think this skirt might throw a little luck MY way! Are we out of the woods yet? No, Taylor…we’re just getting started!! See something you can’t live without? Shop the entire collection today at Tennis Express!